Knight Fencing is a proud member of the Check-a-trade scheme. Check-a-trade allows you to view certified and genuine reviews from past customers, and provide valuable feedback. We have over 720 customer reviews on Check-a-trade, from domestic, commercial and industrial sectors. 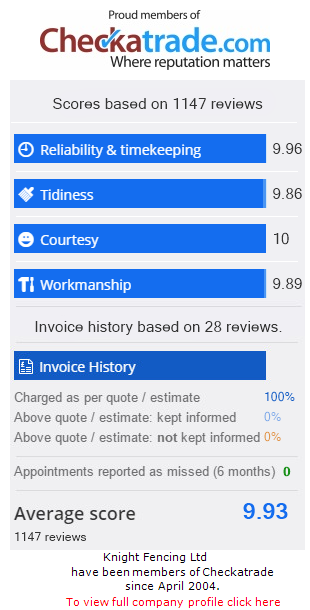 Our average score is 9.73 out of 10, based on factors such as workmanship, reliability, tidiness, courtesy and quote accuracy. Customer in ChichesterTo supply and install 15 fence posts and rails. Customer in Bognor RegisReplace fence panels and posts. Customer in LittlehamptonTo supply and install one new post.